Have you ever arrived at the boat ramp on your favorite lake to find hundreds of rigs lined up to launch? It is obviously many other anglers' favorite waters as well. It may just be time to find some of the highly productive bass waters that are overlooked by the masses. When the famous, highly promoted lakes are crowded, try the more neglected waters for even more success. The Apalachicola River watershed in Northwest Florida in a relatively remote location offers some excellent brackish water fishing for largemouth bass. It is an overlooked bass fishery that is full of cuts and creeks twisting and turning through the marshy flats. For the boater accessing these waters, there are many visible obstructions at low tide that can be skirted or passed over when the tide is high. 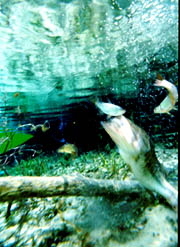 In late October and early November, the creeks are generally full of migrating shrimp and the largemouth follow the forage. Finding the best areas to fish throughout the year depends on the time of day and the tidal influence. You have to watch the tides at the mouth of the river, according to local bass experts. Two tides occurring during the day usually denotes a great opportunity for catching bass. The water movement is "in" twice and "out" twice. When the water is moving, the oxygen is better and conditions are right for catching fish. On some days, there is only one tide. A south wind will blow in the more salty bay water all day long, and when it goes out, it will be very turbulent. That is tough on the fishermen because most do not know how to handle the swift water. When the water is swift, bass usually move. When the oxygen content is up, the fishing is better. The water movement also makes the water dingy and helps the bass fishing. It is usually clear around the mouth of the watershed, though, unless a bad storm has come through. Big, deep-running crankbaits are very productive in the Apalachicola backwaters on big bass in the fall. The area yields quite a few fish over seven pounds. Soft plastic worms, such as the Berkley Power Worms, Culprit worms, etc., and topwater plugs such as the Luhr -Jensen Jerk'n Sam are favorites of Apalachicola river fishermen. Other productive baits in the brackish sloughs are white and yellow spinnerbaits. Drive down any major highway or rural road, and you are bound to parallel a canal. Florida's system of fresh water canals offers a great opportunity for anglers to find and catch bass. For variety and angling success, southwest Florida canals are hard to beat, and it is easy to work a canal. You just put your boat in and start fishing, keeping your boat in the center of the canal. There are very few honey holes where concentrations may be, so it is easier to find them. The canals are reasonably narrow, and only medium distance casts at 45 degrees to the shoreline are needed. Most southwest Florida canals range 10 or 12 feet deep, with an average depth of six feet. The better ones are at least three feet deep. Some will be silted, especially at those points where a little finger canal enters a larger body. If the water has any kind of flow at all and is clear, then the fishing will be good. Most of the better canal waters are normally dark, tea-colored, but if you can see the foot of your trolling motor, you are in business. Clear water canals with visibilities up to five feet are also excellent producers of fish, but the catching is tougher for the average fisherman. Long casts with topwater plugs early and late in the day are often required for success. Largemouth love the aquatic vegetation, but the waterways do not contain forage in large amounts or size. The primary prey fish there are tiny guppy and molly-type minnows. One of the best bass fishing areas in the Charlotte/Sarasota/Desoto county area is in the Gardens of South Cove where 25 miles of canals are interlaced. That is 50 miles of shoreline waiting to be fished. Largemouth of all sizes are numerous along the weedy banks. When searching for optimal fishing waters in that series of canals, check out the ones that are not heavily populated. More rural canals with heavy shoreline cover such as pencil reeds, cattails and bulrushes are ideal fishing spots. Another accessible and productive waterway is The Nine-Mile canal near Port Charlotte. Right in the middle of town are miles of canals that receive virtually no fishing pressure. One such canal, called Morningstar Waterway, is an excellent place to catch fish. There are lots of houses and docks right on the canal, yet, like many other canals, it is an overlooked waterway. In these canals and others in this part of the state, water hyacinths raft up and shiner fishing under the floating cover then produces bass up to seven pounds or more. The key is finding the best trophy bass canals are finding those that do not get choked over. If they get choked over, everything under them dies. The other grasses and vegetation disappears. Almost every canal will have some kind of vegetation, however, and that keeps the pH levels optimum for successful angling. Too low of a pH, due to little or no vegetation, is cause for concern. Fish will move elsewhere. For most canals, small minnow plugs, tubes and topwater fare are effective when fished on 12- or 14-pound monofilament or, better yet , fluorocarbon line. In canals with heavy cover, toss spoons or buzz baits on 17 and 20-pound test lines. Plastic worm fare usually warrants 14-pound monofilament. Buzzbaits are also highly effective in the canals, as are chrome topwater baits. Injured-minnow plugs in gold and black back or silver and black back can be extremely productive. Whether you live in southwest or northwest Florida, or just visit those areas, there are many overlooked waters that are full of largemouth. These two are just prime examples of such. The bass feel neglected, and its time to change that!